This image provided by Star TV of closed circuit television footage from Feb. 13, 2017, shows a woman, left, at Kuala Lumpur International Airport in Sepang, Malaysia, who police say was arrested Wednesday in connection with the death of Kim Jong Nam. "I don't feel I have to wipe everybody out, Tom. Just my enemies." - Michael Corleone in The Godfather Part II. The apparent assassination this week of Kim Jong Nam, the half brother of North Korean leader Kim Jong Un, bolsters the argument that North Korea is a mafia state that operates outside the law, ruthlessly eliminates its enemies and is dependent upon criminal enterprises for survival. On Thursday, Malaysian police arrested a second woman carrying an Indonesian passport suspected of involvement in Kim Jong Nam's murder this week at the Kuala Lumpur International Airport. Another women carrying Vietnamese travel papers was arrested Wednesday in connection with the case. South Korean officials have said two North Korean female agents poisoned Kim Jong Nam at the airport by reportedly spraying him in the face with an unidentified liquid and holding a cloth over his face. The suspected assailants' images were captured by airport close circuit television (CCTV) cameras. A Malaysian government source confirmed to Reuters the suspect detained with a Vietnamese passport was the same woman whose image was captured by CCTV footage showing her wearing a white shirt with the letters "LOL" on the front. Malaysian authorities reportedly also rebuffed efforts by North Korean officials to stop an autopsy from being carried out on the body of Kim Jong Nam. 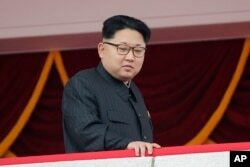 North Korean analysts have categorized the Kim regime as a highly corrupt, family-led criminal enterprise that disregards international laws and is involved in smuggling, arms dealing, including the proliferation of nuclear materials and missile parts, drug trafficking, counterfeiting money, all to generate revenue for the wealthy ruling elite. In 2012 U.N. diplomats flagged North Korean-made graphite cylinders capable of being used to produce ballistic missiles, from a Chinese freighter ship on its way to Syria. In 2005 an official from Ireland was arrested for distributing high-quality counterfeit $100 bills produced by North Korea known as "super-notes." And in 2016 A British citizen was sentenced to 15 years in prison for conspiring to import 100 kilograms of North Korean methamphetamine into the United States. North Korea's illicit activities help them evade international economic sanctions imposed for its continued efforts to develop nuclear weapons and ballistic missile capabilities that have been banned by the United Nations. So ordering the murder of a critic and perceived rival like Kim Jong Nam, even if he is a blood relative, would not be unexpected for a North Korean leadership that operates with an underworld mentality, said Robert Kelly with Pusan National University. "They just don't follow the rules internally and externally. They treat their own people terribly and overseas they basically have engaged in this massive illicit economy and it's not surprising that that would also include illicit political behaviors like assassinations," he said. "Fredo, you're my older brother, and I love you. But don't ever take sides with anyone against the Family again. Ever." - Michael Corleone in the Godfather Part II. If proven, the ordered killing of Kim Jong Nam by the North Korean leader goes beyond stereotypical mafia behavior to actually emulate the classic Godfather movies of the 1970s, that chronicled the rise of a fictional Italian-American family crime syndicate. In the movie Godfather Part II, Fredo Corleone is passed over by his father to become the head of the family crime business in favor of his younger brother Michael. Fredo goes on to betray his brother and (spoiler alert) Michael eventually orders him put to death. Kim Jong Un's older half brother was also once in line to become head of state, but fell out of favor with their father, Kim Jong Il, after he tried to enter Japan on a forged passport to visit Tokyo Disneyland in 2001. He was basically exiled to Macau where he later openly criticized his brother's rule. In 2012 he wrote a note to Japanese journalist Yoji Gomi saying, "The Kim Jong-un regime will not last long. Without reforms." There was also speculation that Chinese President Xi Jinping would have preferred to see him replace his younger brother as the leader of North Korea. Kim Jong Un issued a "standing order" for his half-brother's assassination after he took power, and there was a failed attempt in 2012, according to a briefing given to lawmakers by the South Korean National Intelligence Service this week. FILE - North Korea's leader Kim Jong Un watches a parade in Pyongyang. 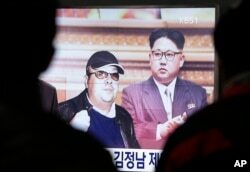 Analysts who view North Korea as a mafia state argue that understanding the criminal mentality of the Kim family government can inform the international community to develop effective strategies to halt Pyongyang's threatening nuclear program and end the widespread repressive human rights violations in the country. Engaging with a criminal state that has repeatedly lied and violated past agreements, Kelly argues, will likely again end in failure. "I have no particular ideological animus against speaking to North Korea. The problem is that they just don't seem to follow through, and we catch them cheating all the time," said Kelly. Cutting off the illicit income of the elites and attempting to prosecute leaders involved in criminal activities, he said, could put real pressure on the regime to change. But that would require more cooperation from China, North Korea's top trading partner and supporter. Beijing has been reluctant to support harsh measures that would threaten the Kim family's hold on power and create regional instability. There was still no mention of Kim Jong Nam's death in North Korean state media as of Thursday morning. At midnight, North Korean leader Kim Jong Un visited the Kumsusan Palace of the Sun to mark the birthday of his father, the late leader Kim Jong Il, who died in 2011. Youmi Kim contributed to this report.